The TI-83 Plus S.E. ViewScreen Calculator (VSC) is the teacher version of the standard TI-83 Plus Silver Edition. It connects with a special port to a ViewScreen panel via a cable. Placing the panel on the overhead projector enlarges the image of the handheld screen so that each student can follow along. The display of the TI-83 Plus Silver Edition sports 64 * 96 dots compared with the 64 * 128 dots of the TI-86 or the 100 * 160 dots of the TI-89. As a consequence introduced Texas Instruments different ViewScreen panels. From a technical point of view the TI-83 Plus S.E. VSC is almost identical with the students TI-83 Plus S.E.. The first difference you notice is a slightly changed bottom shell of the calculator housing to accommodate the ViewScreen connector. Dismantling the TI-83 Plus S.E. VSC reveals a total of three printed circuit boards (PCBs). The main PCB is identical with the TI-83 Plus S.E. and makes use of the TI-REF83PL2M/TA2 ASIC integrating a Z-80 microprocessor plus supporting logic surrounded by a Cypress CY62128VLL featuring 128k Bytes S-RAM and a Fujitsu F29LV160 Flash-ROM with 2M Byte storage space. Even the display board of the TI-83 Plus S.E. VSC is identical with the TI-83 Plus S.E. but sports an additional connector for the third PCB. If you compare the PCB with the student TI-83 Plus S.E. you'll notice that the layout of the PCB is identical, only the connector itself is either assembled or not in place. A third PCB is connected with a short piece of flat-cable to the display board. 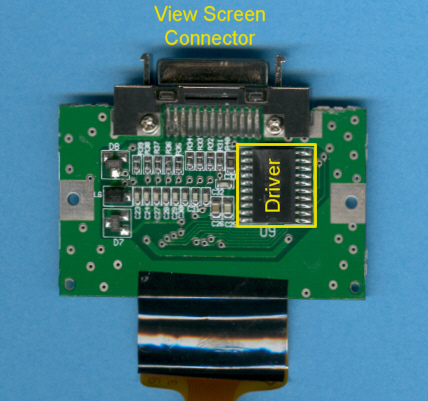 This PCB basically buffers the signals of the LC-Display and feeds them to the external ViewScreen connector. A deeper exploration of the display board shows the unbelievable high density of electrical connections between the Toshiba T6K04 display controller and the graphics screen. Don't miss the colorful slide cases developed for the TI-83 Plus, they fit on the TI-83 Plus Silver Edition ViewScreen, too. The TI-83 Plus S.E. VSC is permitted (as of September 27, 2007) for use on SAT, ACT, PSAT and AP exams. The TI-83 Plus Silver Edition Graphing Calculator has been discontinued (as of June 8, 2008) and is no longer available at most retail locations.